Stuntwoman and actress Jessie Graff stretches upside down in her living room turned gym in Calabasas, California February 20, 2016. 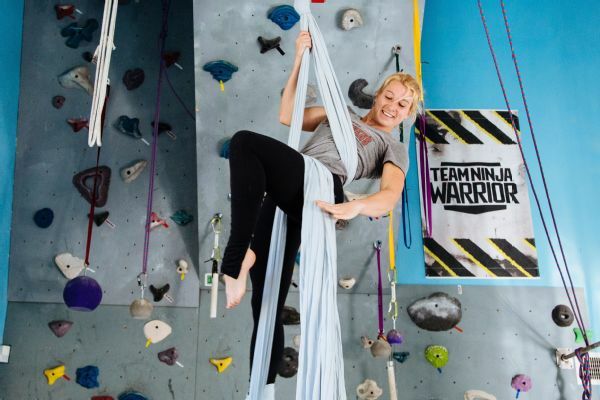 CALABASAS, Calif. -- "We don't allow shoes on the gym floor," says Jessie Graff as she opens the front door to her house in Calabasas, California, -- a city in the San Fernando Valley, just northwest of Los Angeles. In any other home, the door would lead into a standard living room, but in Graff's house, visitors enter onto a soft-spring floor, the texture of which is somewhere between memory foam and that of a gymnastics studio. There's a climbing wall on the left, and cylinders, hooked into carabineers, hanging from the 15-foot ceiling. In the middle of the room stands a pillar with a vertical-jump pegboard; mirrors line the right wall, and in the back is a squat rack that doubles as a ladder up to a loft. It's not an overly large space, but the room's sky blue walls hold together more than a simple training area -- they prop up a dream, too. Graff, 32, is mostly known for appearances in the "American Ninja Warrior" and "Team Ninja Warrior" television shows. But she's also a stunt woman who works regularly on a variety of movies and TV series. She has a black belt in taekwondo, a black sash in Kung Fu and first fell in love with doing flips after convincing her parents to let her train for the circus when she was young. She grew up a gymnast and added pole vaulting in high school, a sport that earned her a scholarship to Georgia Tech. Her career has become staying healthy and in shape -- no easy task considering she's constantly throwing her body through glass, riding motorcycles and jumping on to moving trains. 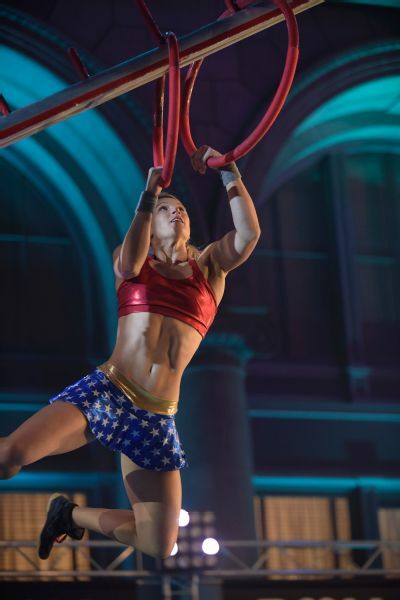 But her focus on fitness has helped her become one of the most accomplished women on "American Ninja Warrior," a show where women compete against men on the same obstacle course with the same standards for winning. She was the second woman ever to reach the show's Las Vegas finals outright (without getting chosen through a wild card). She was the second to finish the jumping spider, an obstacle where participants must hold themselves between two suspended walls. 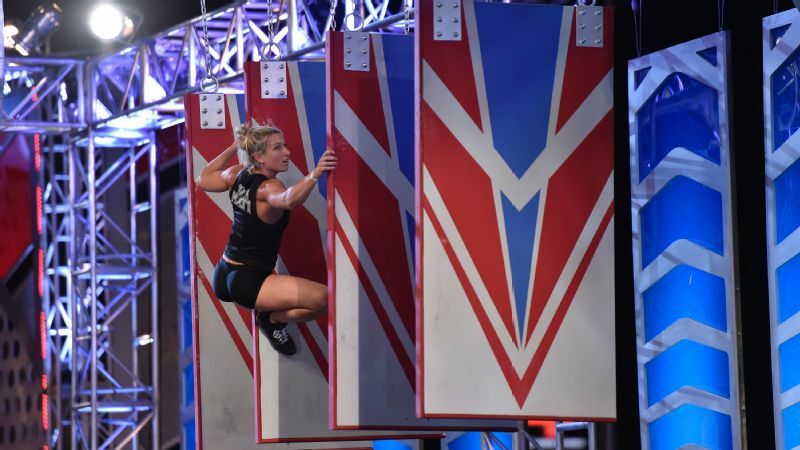 And she was the fourth female competitor to run up the warped wall -- a 14-foot vertical that competitors must scale to finish a course. Her motivation is a delicate balance of knowing her best is yet to come, and seeing her opportunities for making history seemingly pass her by. 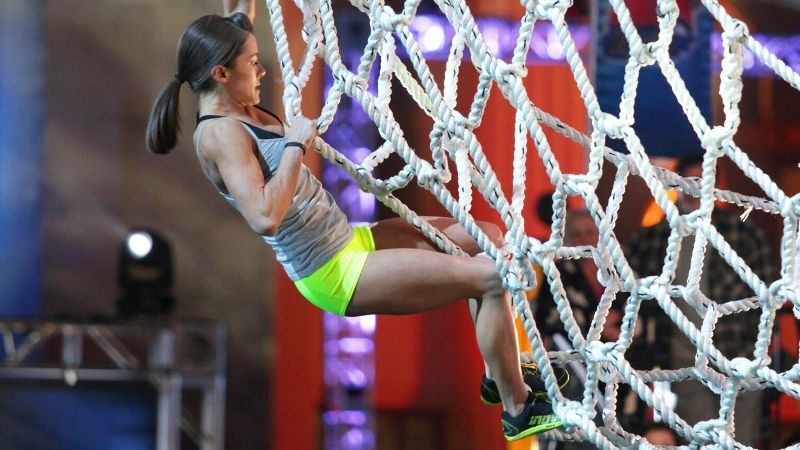 In 2014, a blown knee kept her from competing on the show, and she watched from the sidelines as Kacy Catanzaro, Meagan Martin and Michelle Warnky attained all the firsts she was chasing. 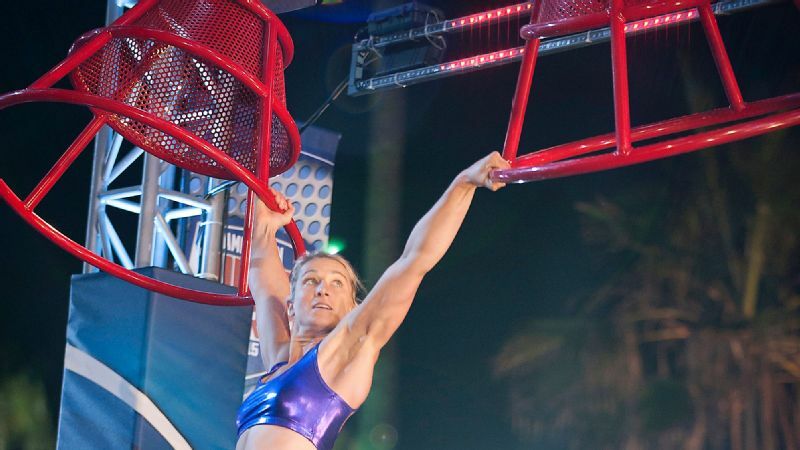 There aren't many firsts left for Graff to reach, but as she rehabbed her knee, she decided to make "American Ninja Warrior" her mission. Graff's fingers gently coil around a rope dangling from the ceiling in her living-room-turned-gym. The rope runs through a pulley, with one end attached to a carabineer. "This is where I measure my vertical jump," she says, putting her coffee cup down on the stairs. She takes one step and explodes up the rope, grabbing it and jerking down. She lands with barely a thud, stretches her arm to the ceiling and reads the marker underneath the carabineer. Twenty-nine inches. "That's not bad, considering I haven't warmed up." She grabs her cup and takes a sip. "My record is 29 and a half, but I really want 30 inches." Graff has built her living room to support her training for "American Ninja Warrior." She tracks all her stats on a board sitting in the corner -- which also records the feats of her friends; everyone from circus performers, to other ninjas, to stunt people have tested themselves on her many obstacles. The people she shares her time with are as varied as her many interests, pastimes and professions. Graff is motivated by numbers; beating a standard she already set for herself gives her something to constantly be working toward. And she works out -- a lot. In fact, she doesn't really ever stop moving. "This house is becoming more of a home because now I have things to play on." "Play" is a word she uses often. For Graff, none of her work or her surroundings is out of the ordinary or difficult. It's all fun, and she's all smiles. Unless she has to be at set, she wakes up whenever she wants and meets up with a few folks throughout the day to train (a word she uses broadly). There's no regimented schedule; she does what interests her at the time. Nothing more, nothing less. Despite her constant motion, she claims she was actually a pretty quiet kid. It wasn't until she started circus gymnastics that she started to come out of her shell. "My strategy for making friends as a kid was to do the coolest tricks on the playground. That's how I learned to interact with people," she confessed with a laugh. "It hadn't occurred to me to start a conversation. I had no idea how to do that." Of course, this explained why instead of walking to retrieve her jacket from her kicking dummy -- lovingly named Shredder -- Graff dives on the floor, and then walks to the door on her knees. We just met, and she needs a conversation starter. Graff competes on Stage 3 obstacle the Floating Boards as a part of the "American Ninja Warrior" All-Stars episode. She and Meagan Martin were the only two women selected to compete. Graff comes from a family of performers. Her father teaches middle school drama classes, and her mother, a dancer and actor, was cast in the original production of Pippin. Graff spent her early years in New York City, before moving to Pennsylvania after her parents divorced, and then to Maryland when her mother remarried. Graff wants to be an actress eventually as well. The draw of the theater and entertainment industries is, in fact, a core reason for her athletic success. "When I told my mom I wanted to be an actress, she told me to go to the Olympics because it's easier to get into show business that way. That was always the goal, it just didn't work out." Graff picked up pole vaulting in high school after she aged out of gymnastics. She won six Maryland state championships (three indoor and three outdoor), won the 2001 Young Women's AAU Junior Olympic Nationals and placed fifth at the U.S. Junior National Championships in 2002. Her high school competition record held for eight years before being broken in 2010. When I told my mom I wanted to be an actress, she told me to go to the Olympics because it's easier to get into show business that way. As one of the top pole vaulters in the country, she accepted a scholarship to Georgia Tech. She wanted to go to the Olympics, but her highest jump was a couple of inches short of enough to qualify. So Graff transferred to Nebraska after a year at Georgia Tech to study theater and chase acting. She decided to move out to Los Angeles after a meeting with her mother's agent -- one that didn't go as planned. Graff accidentally gave the agent a resume that she'd made for the circus in high school. "She looked at it and was like, 'What is this? Do you act? You should be a stunt woman. Call this guy.' And she shooed me out of her office before I even knew what was going on," Graff says with a laugh. For the next few months, Graff spent her days training and "hustling," as she calls it -- driving around the streets of L.A., looking for production crews so she could maneuver herself onto set and find the stunt coordinator to give them a resume. Skirting security was more than implied. "It was a lot easier when more movies were actually filmed in L.A.," Graff says. Just as essential as being able to put herself out there is knowing where she falls in the stunting landscape. "The leading action stars for women are tall and skinny. I'm close enough to that demographic to be in high demand, because there are not many tall, skinny women who can do flips. That means I'm in a position where it's more beneficial for me to be really well-rounded." There are skills that stunt people have to know how to do, like taking falls and reacting to being hit. Graff says she's particularly good at wiping out. Within the stunt world, however, there are certain skills that are more specific, like pole vaulting. "You either pole vaulted for 10 years, or you didn't," Graff says. She coaches high school students in her spare time, which is exciting for her. Being there every day is impossible, but she tries to at least get there once a week. "I think one of the reasons I still fixate on pole vaulting is that it feels like unfinished business." For someone as hungry as Graff, "what ifs" linger. Graff performs flips on rings at Muscle Beach in Santa Monica, California on February 20, 2016. She has developed ways to turn her training into "play," a word she uses often. Graff moves around her kitchen, making lunch. She grabs greens, Greek yogurt, blueberries and cranberries before throwing the chicken into the oven to bake. After finally sitting down, she groans. "I forgot the kale." So she skips out to the garden she keeps, cuts a few leaves, comes back and lays them on the table. "It rained, so it's already been washed," she says with a toothy grin. Graff has a bit of a sweet tooth. She mixes in the yogurt and berries. "I like the yogurt instead of dressing, and the fruit makes it a bit sweet. And that is how I eat more greens." Graff's approach to food is similar to how she approaches her training in general, balancing what she wants with what she knows she needs to do. To make the latter more palatable, Graff sometimes employs tricks to get there. Thinking about food in terms of staying thin and capitulating to the pressures she feels doesn't motivate her to make good decisions. "I've found that certain language helps me stick to good habits more than other language." Graff attempts a new obstacle in the Los Angeles region of American Ninja Warrior. Graff offers me a low sugar, carbonated drink; she would love for the company to sponsor her. She thinks about endorsements a lot as she grows her social media presence, which stands to increase exponentially if she continues to perform well on "American Ninja Warrior." 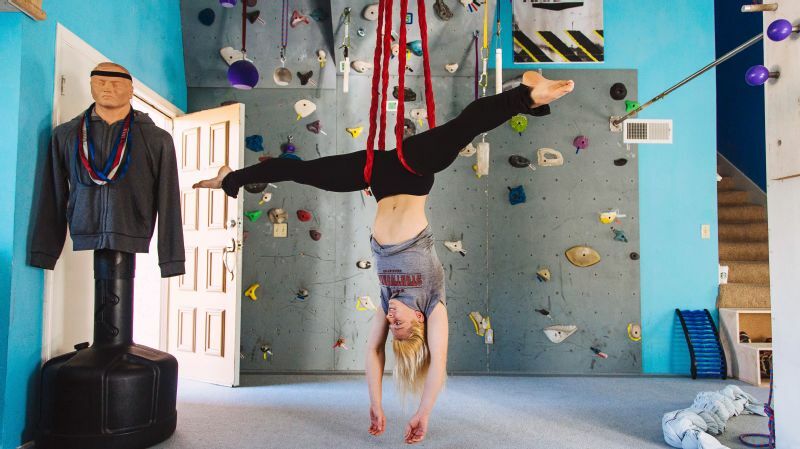 Her focus on endorsements and pretty Instagram photos are a reminder that Jessie Graff is Hollywood through and through. Her athletic talents are important to her, as is her drive to "make it." Those parts of her are entwined and often coexist harmoniously, but sometimes they compete heavily as well. She wants to feel well and be physically able to move the way she wants to (Graff doesn't eat ice cream often because it makes her feel sluggish). But she has encountered pangs of pressure we typically associate with Hollywood bodies. "I wasn't working upper body stuff except for boxing for a long time, because being skinny is standard priority," she says. With her increased muscle mass, though, has come complications for her day job. There's a formula for the weight Graff puts on her resume. Taking into account the fact that actresses are not typically muscularly dense (and that they lie by about 10 pounds), Graff is careful about what number she puts down. She currently weighs a little more than 140 pounds, but her resume reads 125 pounds. "My actual weight has come to be a very irrelevant number," Graff comments. "We just operate on a different scale." Costume fittings are not always Graff's favorite. She's more muscular than many of the women she doubles -- and she hears comments about it often. It used to trigger thoughts that she needed to run more and focus on trimming the size of her body. "Now I'm like, whatever. My legs are useful for things, and I'm okay with not being the same size as someone who doesn't need to jump as high. If you're going to fire me for it, then I will get another job, and if you're not going to fire me for it, then relax and get me a bigger size pants." The change in attitude is due, in large part, to the number of fans who love her for exactly who she is: an athlete. "I've had such a positive response from Ninja Warrior and the public for getting strong that at this point I am probably losing work for being more muscular." Graff pauses briefly. "And, whatever. It's not like I'm struggling to get work either, so if I lose a couple jobs but am stronger, healthier, more durable, that's worth it to me." Graff's friends -- other ninjas, circus performers and stunt people -- are as varied as her interests. She does acroyoga with teammate Travis Brewer on the beach in Santa Monica, California. After a long day of working on the set of "Supergirl," Graff lays on a bench facing a TV that isn't turned on. Her hands grip a set of adjustable dumbbells before pushing them off her chest. "Ninja training does nothing for pushing muscles," she says between reps.
"I'm not where I should be," she says as she finishes her set. Looking at the weight for each dumbbell, she confesses they are for 40 pounds. "That's better than I thought," she laughs. "When I first started training upper body after my knee injury, I could only do 15 or 20 pounds." These moments are rare, the workouts where Graff is forced to remain in a fixed place and count her reps. Structured workouts are not her thing, but that's why the bench faces the TV. Even if she doesn't like it, she knows that there are times when she needs to lift and stretch. It is during those moments that she binges whatever TV show she's into at the time. "I love Netflix," she says with a smile. "A lot of ninjas call me the top female competitor on 'American Ninja Warrior,' but Meagan [Martin], Kacy [Catanzaro] and Michelle [Warnky] have all hit buzzers, and I still haven't done it on 'American Ninja Warrior.'" This past season, Graff lived up to many expectations. She qualified for her regional final course, and made it all the way to the ninth obstacle (out of 10). She tied Martin's record on Stage 1 of "American Ninja Warrior" finals, stalling at the more difficult version of the warped wall. She wasn't completely healthy when she ran the course, quietly dealing with a hip injury, which kept her from training sprints and lower body explosion in the weeks leading up to the Vegas finals. "I don't know what is worse for me, failing the warped wall completely healthy, or admitting that I'm fragile enough to break. "I'm almost scared to admit how much I want it," she says. As quickly as her emotion began to show, it's gone. "I find that I am the type of person who has such strong tunnel-vision focus, so I think I will improve more by focusing less on it." With the door closed on the Olympics, she is left staring down the warped wall at Stage 1. Getting over that wall means moving on and making history. But it's not about history, it's about leaving nothing unfinished.